WTH in an iPhone text message. If you just saw "WTH" written somewhere online or in a text message, don't just assume that the word "with" was misspelled. It's actually a pretty popular acronym! "Heck" is of course the less profane alternative to the word "hell." 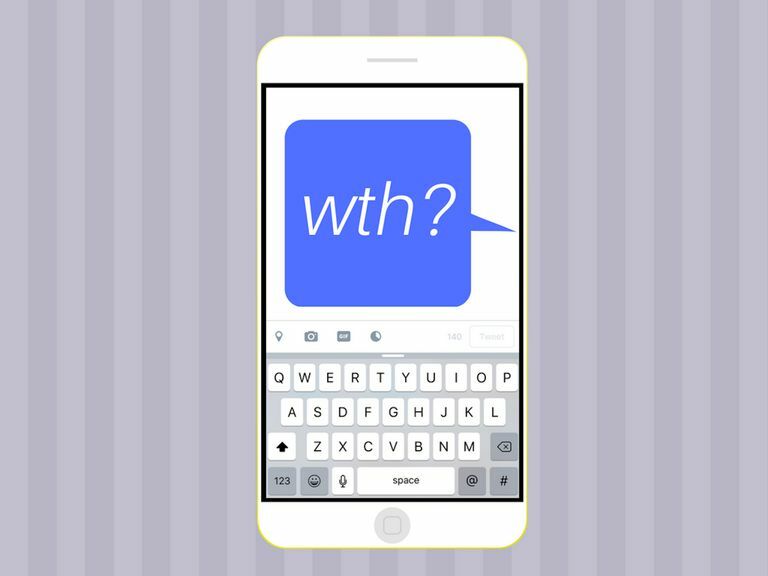 Both interpretations of WTH are used the same way, although it's up to the reader to decide whether they want to interpret the acronym as "What the hell," or "What the heck." As an expression on its own with nothing after it, used either to say that you don't care about the consequences of an action or that you don't understand something. As a question about something (the "what") while emphasizing shock, disbelief, astonishment, confusion or uncertainty. WTH is almost always framed as a question. The question can be asked in a genuine way for the purpose of seeking an answer from others, although WTH is often saved for rhetorical questions that create a dramatic effect and help share an emotionally charged opinion. Friend #1: "Wanna skip class tomorrow to go to the beach?" Friend #2: "Eh, WTH! Let's do it." This first example demonstrates how WTH can be used to express carefree interest in any negative consequences of a particular outcome. Friend #2 uses it as the verbal equivalent of throwing their hands up in the air in their decision to do something they know they could possibly regret later. Friend #1: "Me n my bae g2g ch1ll tmr"
Friend #2: "WTH? Can you speak English please?" In the second example above, WTH is used to express confusion. Friend #2 doesn't understand Friend #1's message and uses it to help ask for clarification. Friend #1: "Dave said he accidentally deleted the file for the group project..."
Friend #2: "WTH are we gonna do now?" This third example shows how WTH can be worked into a "what" question. Friend #2 uses it to emphasize their uncertainty about what to do. Friend #1: "I just saw someone walking their dog ignore the huge turd it left on the sidewalk." Friend #2: "WTH is wrong with people?!!!" Finally, in this last example, WTH is used in a rhetorical "what" question. Friend #1 makes a statement and then Friend #2 uses WTH to react in a dramatic way. Friend #2 isn't looking for an answer to their question—they're simply expressing their shock and distaste for the dog walker's behavior. If you want to get even more vulgar with your acronyms, you can swap out WTH for its more profane (and more popular) relative, WTF. It stands for What The F***. Yes, that's an F-bomb. WTF can be used exactly the same way as WTH, but be careful when and where you use it. You might offend some people even worse than you would if you had just stuck to WTH. If you want to keep your conversation friendly and more polite, you can swap WTH out for WITW. This acronym has no curse words in it and simply stands for What In The World. The only big downside to this less profane acronym is that it's not very popular, so others might have trouble interpreting it. Still, it can be a good option to have when you just aren't sure if you should be throwing curse words around—even if they're hidden by acronyms! What in the World Does IDGI Mean? What in the World Does CTFD Mean? What in the World Does PTFO Mean?